That is awesome, Manji! Do u take requests? OMG that is good . Actuallly, I just use regular #2HB pencils... I did just recently purchase a pack with B, 2B, HB drawing pencils though! I'm working on a drawing of Queen Amidala with those, and so far they are working out nicely. Could you maybe do something with ARCs or commandos? (I love Etain & Darman! ) Or maybe something of Jaster Mereel? How did I not see this thread before? This is great work! 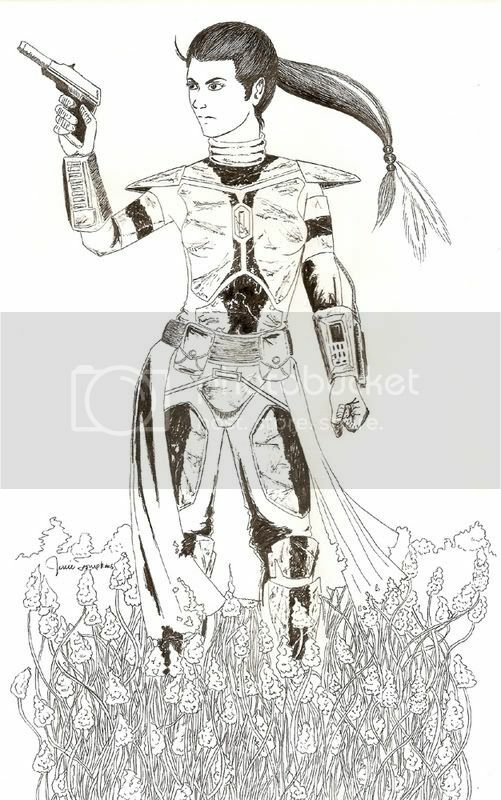 I thought about doing that too--drawing myself in Mando armor--that'd be fun! Manji--great work and you certainly have the art of smooth rendering down to a t! You understand proportions well. I also liked the stick figures--I thought those were cute! I posted most my stuff at another thread, but I haven't done much in the way of Mandos lately. 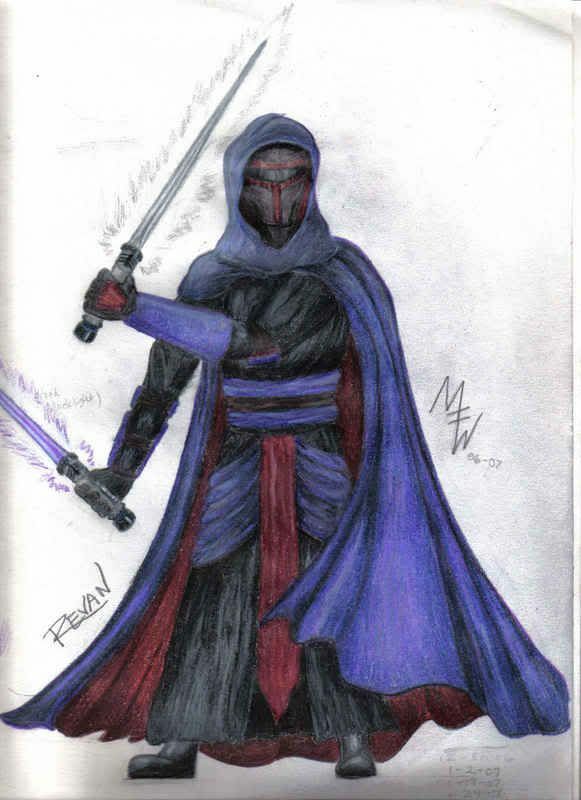 However, I did finish a Revan drawing. 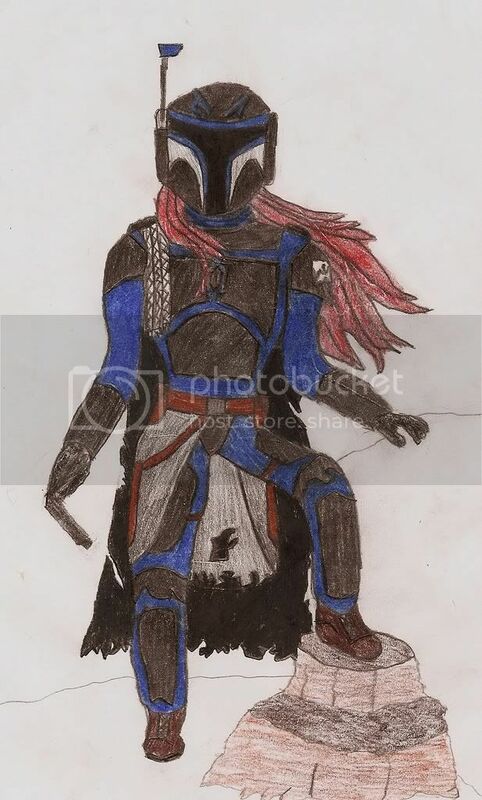 Not my best, but I'm not as familiar with him as I am with Fett or Mandos. I only just a couple of days ago got to see him breifly where I am in KOTOR. I think he turned out a little dark, but I think I did better with hands this time. I neglected to leave enough clearance to color in a proper highlight coming from the top lightsaber, so it doesn't look quite right. I had to have my husband pose like that so I could at least decently draw the left arm. He liked me having to use him for a model I think LOL. nice, im gonna dig up some of my fett art...is that chalk? No--it's Prismacolors, a sort of hybrid of colored pencil and crayon. It works like a colored pencil, but can be layered a lot and has a waxy sheen to it when finished. It doesn't erase as easily unless the strokes are very light, otherwise, it can be scraped off using something like an Exacto knife, which is how I usually do it. The reason it shows up a bit like chalk is because I need to use a smoother paper like bristol board--so far, these are all done in my sketchbook on basic grade paper really made more for pencils, but can accomodate most mediums. I'd like to see some of your Fett stuff! Here is one of mine with an ultra-fine point Sharpie pen. I bow down to Manji_Ninja for his superior art skills. nice work revan. that is some sick detail with a sharpy. props. Very nice Revan! Looks like a drawing out of a comic book--nice style. I'm jealous that I do not draw hands quite as well--his left hand I keep looking at it because I'd like to draw hands as well as that I also like your viewing angle. It's not a head-on view, but rather it looks as though the viewer is looking up to Fett as he's walking toward them. 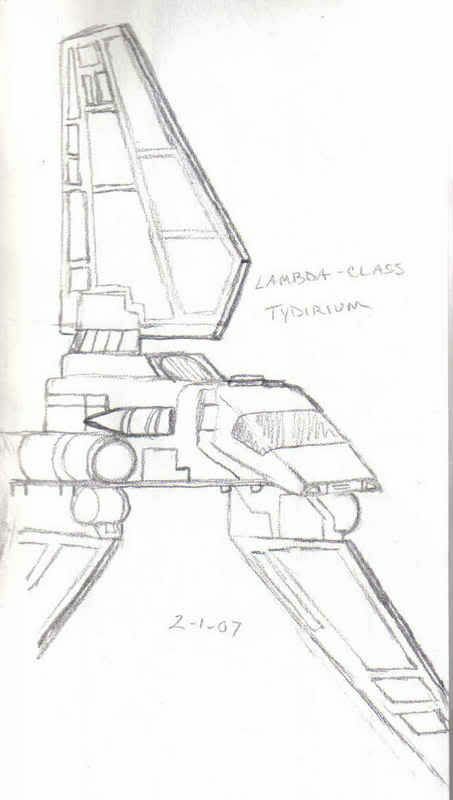 Here's a couple of vehicles: the AT-AT and the Tydirium. Both were using references, pencil, and together took maybe about 1.5 hours so far. There are a few things I'm going to fix on the AT-AT (as usual, seeing things on the computer has me noticing mistakes). I'll be adding color eventually. Ya, just strait-up ink. 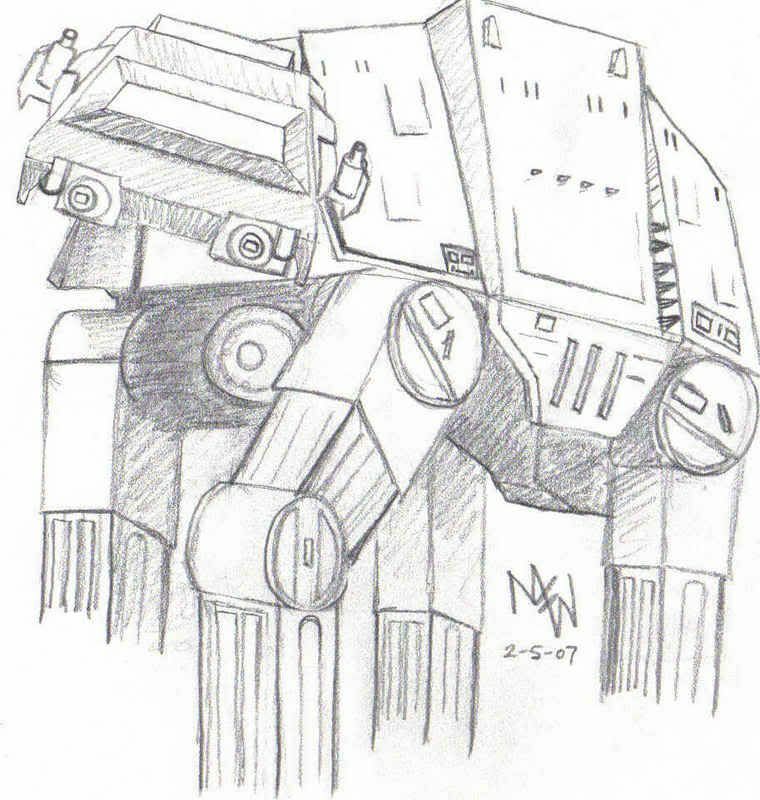 I based it on a pic from Shadows of the Empire. LOL--the picuture I used as reference was one I took at Walt Disney World almost 11 years ago. I purposely took it at just that angle, but have never drawn one before. Finally I got this up! It's my first attempt to actually draw something and its not really good so don't throw things at me. I did it with colored pencils and a pencil for armor color.